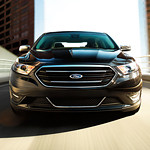 Safety And Style In The Ford Taurus | Donley Ford of Galion Inc. If you're looking for a luxurious car and one that has the comfort that you need while driving, then consider the Ford Taurus. A large trunk provides an exceptional amount of space for all of your luggage while traveling and the purchases you make while in Galion. Cloth seats offer room for five people in the vehicle. However, Donley Ford of Galion Inc. could offer an option of leather seats with an upgraded model. The front seats can be adjusted in six different ways and are heated. In the upgraded version of the Taurus, the front seats have a massage feature. Stay safe while backing up with the rearview camera. There's no need for a traditional car because of the push-button start feature. Forward collision warning and automatic emergency braking are safety options featured in the vehicle. The Sony 12-speaker sound system provides an experience of being in a theater instead of being in a vehicle with multiple settings for adjusting the sound.